I'm a little late to the game sharing a Valentine's polish, but it still looks pretty springy! This one is from Noodles Nail Polish a indie I recently fell in love with for their amazing crellies. The polish I'm going to share with you today is meant to be a Valentine's version of their Peppermint Twist polish (which was in my Top 25 of 2015) from the holidays. This one unlike the other Noodles Nail Polishes did fall a little flat for me, but I'll explain that later. Mint For Each Other is a white based crelly full of mint, aqua, silver, magenta, and pink glitters as well as mini pink hearts. Color: I absolutely love this color. 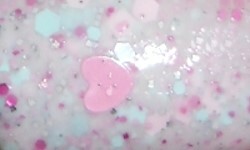 I adored Peppermint Twist, so I love this Valentine's version as well. I love the pairing of the pink and mint. It's really a cute and great color combination. I also love that this a crelly polish. Noodles nails crelly polishes. Formula: I wish this polish did not have pink heart glitters in it otherwise I would give it a glowing review. These pink hearts were a PITA to get out as evidenced by my swatch. I could only manage to get one heart out. It was frustrating me beyond belief trying to get these hearts out. The formula itself sans the hearts was good. It was on the thick side, but it applied smoothly and opaquely in 3 coats. This polish didn't need the hearts in it. I think the polish looks great without them. The hearts really tarnished my view on this polish because how frustrating they were. Plus, they were in a white crelly base which made them hard to see. Price: This one is no longer available. I'm not sure if it will be remade, but Noodles does have other excellent polishes on her etsy site. Overall: This polish really pushed my buttons. Those darn hearts! That being said, hearts out of the picture I'm in love with this polish. I don't want this to deter anyone from purchasing this brand. I've reviewed a handful of other Noodles Nail Polishes I absolutely loved and some even made my Top 25 list from last year. This one just didn't work out for me based on stupid heart glitter. I didn't feel the polish needed them because it's great on its own and they really tested my patience. This would of been a golden 5 paint splatter polish without the hearts!